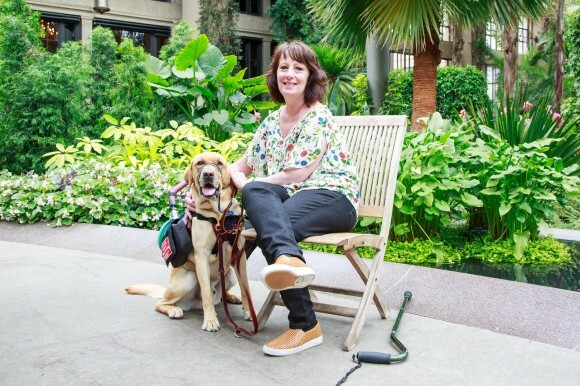 For Renee, the decision to apply for a service dog did not come easy. After years of visiting specialist after specialist she was eventually diagnosed with several medical conditions including POTS (Postural Orthostatic Tachycardia Syndrome) and Chronic Lyme Disease. Although each of her conditions severely impacted her ability to live a carefree life, Renee was hopeful that one day she would find a cure for her conditions and regain her independence. Unfortunately after several years, it became evident that her health was not going to return to normal. Daily tasks like cleaning the house and going to the grocery store became burdens and required assistance. Renee’s family and doctors began to encourage her to apply for a service dog. 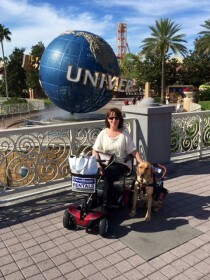 As a former obedience dog trainer, Renee consulted professionals in the service dog industry and made the decision to train her own dog, Sammy. Renee and Sammy successfully worked together for 7 years. When it became time to retire Sammy and consider a successor service dog, Renee remembered a conversation she had with CPL Program Director, Megan Esherick. Renee met Megan at a dog agility competition several years earlier and the conversation about Canine Partners for Life was still in the back of her mind. With her increasing medical needs, she knew CPL would be the right fit for her successor dog. Renee and Ranger have an exciting life ahead of them. They will soon be escorting her son down the aisle to be married. Ranger will join Renee for the mother-son dance and even has a boutonniere to match the groomsmen. This team has many more exciting adventures to come!